Look, it’s a crossover! People love crossovers, right? Right? This doesn’t really merit a comic, but here you go. So, do I think Blizzard has Horde bias? All joking aside, I’d say: kinda. Now, I don’t think it’s a deliberate bias. I don’t think Blizzard is out to willfully mess with Alliance players or bump up the Horde. That kind of pettiness may live in the hearts of thousands of forum trolls, but Blizzard is above that. You can’t run a successful company and maintain one of the world’s biggest game franchises if you’re busy giving the finger to half your customer base. I’m sure there are some individuals at Blizzard with a pro-Horde bias, and some with a pro-Alliance bias, but if they weren’t mature enough to set those feelings aside when it comes to building a game for everyone, they wouldn’t be working at Blizzard very long. Let’s acquit Blizzard of malice. No, I think the problem is subtler than that. What I think is happening is that Blizzard, as a collective, views World of Warcraft from a Horde perspective. I don’t mean that they don’t care about the Alliance or that they give the Horde priority, but that they seem to have trouble thinking about how Alliance players experience the game absent the context provided by the Horde perspective. What does that mean? Let me explain. I’ve been playing WoW since just before Burning Crusade and for most of that time I’ve had both Horde and Alliance characters, but until the end of Wrath of the Lich King it was my Alliance characters that I played the most. When I started getting burned out on running Icecrown Citadel four nights a week, I relaxed by going over to my Horde characters and playing them. Pretty soon, I had been through the leveling experience from both the Alliance and the Horde side and I started to notice the differences. Places and people and quests that meant nothing to me or made no sense from the Alliance side suddenly came into focus as the Horde experience explained them to me. An Alliance player entering Outland encounters rampaging demons, funny-colored orcs, and arrogant blood elves, none of which means very much except a different set of creatures to kill and take their stuff. 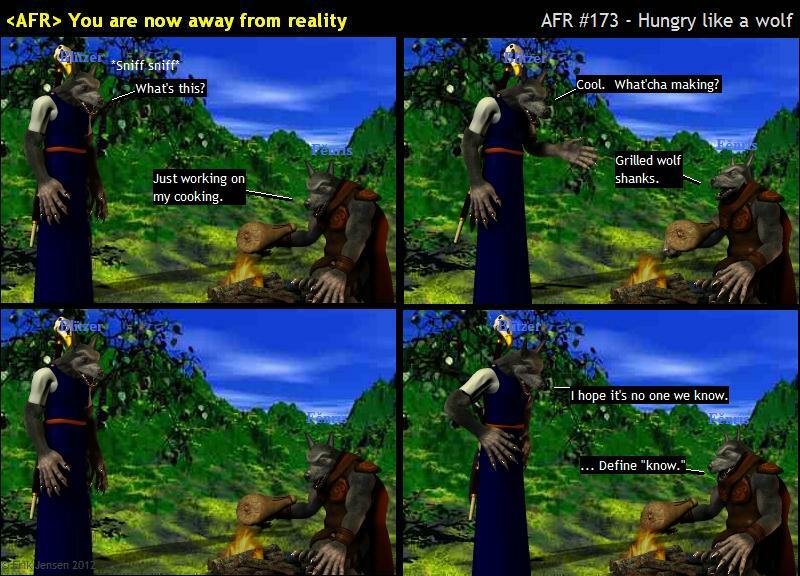 Hellfire’s quests are all about surviving the harsh surroundings. For the Horde, Outland is a momentous place full of meaning and history and Hellfire’s quests set you up to dig deeper into that history as you move further into Outland, to the uncorrupted orcs in Nagrand and the blood elf plots in Netherstorm. This doesn’t make Outland a bad zone for the Alliance. I can still remember being blown away by the experience my first time through, and if it seems a little passe and shopworn now that is only because of age and familiarity. Alliance gets a perfectly good questing experience, but the story belongs to the Horde. In Northrend, when the Alliance get to the Wrathgate, Putress and the new plague come out of nowhere. We’ve never heard of this guy or seen any of the preparations and then suddenly we’re whisked away to Undercity to follow in the wake of Varian Wrynn’s quest for vengeance for a thing that was never properly explained. Horde players have followed the making and testing of the new plague through questline after questline ever since they arrived in Northrend. When the plague bombs start landing in the midst of the battle it is the satisfying culmination of several levels’ worth of build up. In terms of gameplay and mechanics, the Alliance and Horde quests leading up to and following on from the Wrathgate are effectively identical, and everyone sees the same cutscene, but the whole thing only makes sense when you know the Horde side of it. When Alliance players get sent into the Maelstrom at the introduction to Cataclysm, they meet some blue-eyed orc with odd taste in accessories who tells them to get busy saving the world. They later come back to save the same orc’s spirit from the elements and then watch him get married to some other orc who once gave them a ride into Deepholme. Horde players get to have a moment with their beloved former warchief, to watch him transcend the struggles and doubts which had plagued him all his tormented life, rescue him from his personal demons, and see him restored to the hope of a normal life drawing on the ancient traditions of his people. 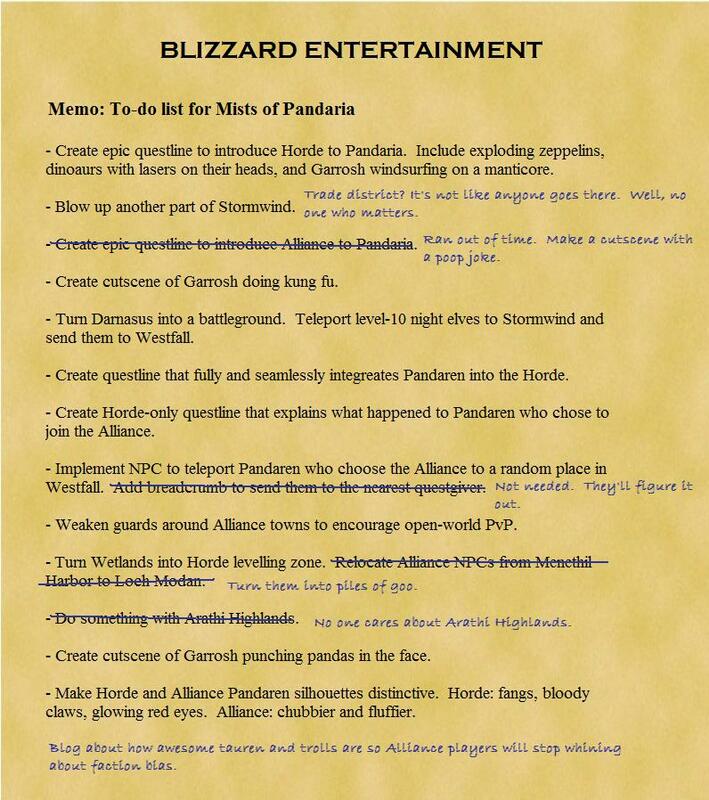 Again, all the quests and scenes are the same, but they are only meaningful in a Horde context. Alliance players are just along for the ride. This is where I see the Horde bias in WoW— not that there is some snickering miscreant behind the scenes making Allies suffer, but that the world seems to be designed for the Horde experience first and foremost. It’s the Horde’s story, the Alliance just gets to go along and admire the scenery. The problem for Blizzard is that they know both the Horde and Alliance sides of the game too well. I think they honestly don’t see how skewed the experience of the game is from the inside because they know it too well from the outside. They can legitimately say that the Alliance get to do lots of awesome things in Cataclysm: Stormwind’s special foreces have captured Thrall; renegade Gilneans are waging a daring guerila campaign against the undead in Silverpine; Wildhammer griffon riders are staging an all-out assault on the Krazwerks in Twilight Highlands. The trouble is that Alliance players never see any of it. To see the Alliance performing at its best you have to play Horde. That’s a problem. It doesn’t mean that Horde players are getting a better game than the Alliance, but that game is in a world that is designed to be seen through Horde eyes. To put the cherry on top of the Blizzard-doesn’t-get-it sundae, they responded to player feelings of pro-Horde bias by writing a post all about how awesome orcs are. So, with Mists of Pandaria coming, we can ask: what will it take to make Alliance players feel like Blizzard is giving them a fair shake? Someone has to seriously ask the question: what is the Alliance experience in Pandaria as Alliance players see it? 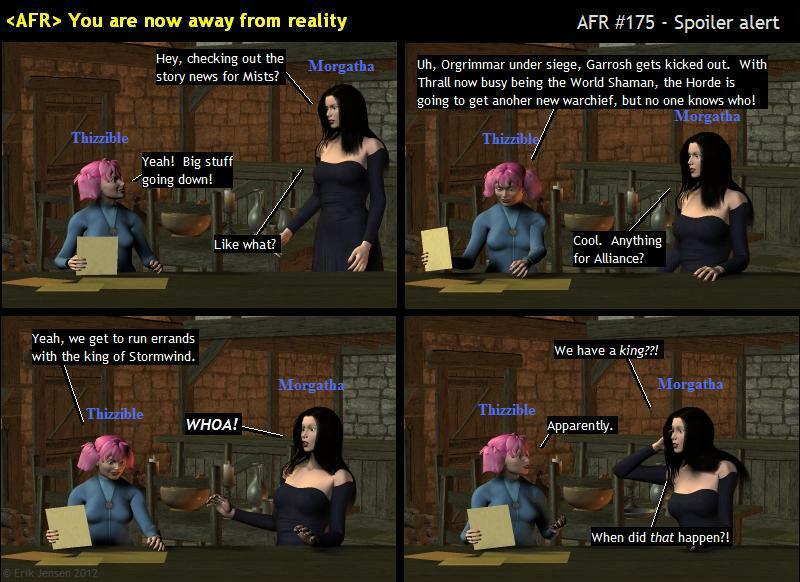 Not the Alliance experience as backdrop for or adjunct to the Horde story, not the way Horde players encounter the Alliance, but the way the world looks as Alliance players see and know it. I don’t want Horde players to have a worse experience; I don’t even want them to be shifted into the background the way that Alliance players have always been. I just want to sit down to play Pandaria and feel like I’m getting a whole story, not just playing an extra in the Horde’s movie.